“After long hot months of the orchards swaying languorously to the murmuring of butterflies & bees, I love this change of tempo as we quickstep into autumn, and lazy summer days seem to replace themselves with the crisp industry of harvest. 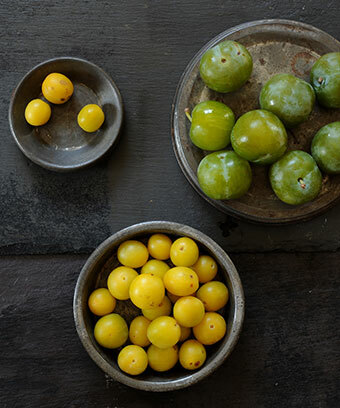 Apples hang heavily on the trees, begging to be plucked, and damsons, greengages and plums all but leap into the pot, oh my god – I cannot wait to get into my kitchen and turn them all into crumbles, compotes and jams. In Franche-Comté where I grew up Maman Blanc’s stove top would be brimming with bubbling pots of delicious Mirabelle plums. The gorgeous little pink-splattered yellow fruits that my family’s area is famous for, filling the kitchen with a beautiful perfume. You can still see the plums harvested in the same way today; by shaking the branches with a special long hook, or if you were a greedy little boy growing up there, by just shaking the tree very very hard! Here in England the plums come in all colours, shapes and sizes. All equally delicious.